The Eagles should be mindful of the "A.J. McCarron situation," in regard to Sidney Jones. In our weekly Eagles chat this week, there were a lot of questions that we could not get to in time or other questions we did answer but could use more color. And so, let's do a mailbag post to answer some of the overflow, as well as some emails I've received. Question from Mushstash: If you fell running the 40 yard dash, could you finish faster than 5.9 seconds? Mushstash is of course referring to poor Orlando Brown, who had one of the worst Combine performances in the history of the NFL. Earlier this week, I named Brown as a possibility for the Eagles' first round pick. I would officially like to distance myself from that as soon as humanly possible. Sooooooo, let me suggest another guy instead. I like Brian O'Neill from Pitt quite a bit as well. O'Neill is a local kid from Salesianum School in Wilmington, DE, who enrolled at Pitt as a tight end before moving to RT, where he started the last two years. He is now playing LT in 2017. Under Doug Pederson, the Eagles have prioritized versatility from their offensive linemen, and have embraced the long-term potential of tight ends converted to tackle, as evidenced by Dillon Gordon, who the team was very high on at one time, but did not improve enough from last year to this year to make the team. I'm not sure O'Neill is worth a first round pick, but certainly he's an impressive athlete who would fit in nicely in the Eagles' offense. Question from Kevin: Any chance the Eagles have to worry about Sidney Jones doing what A.J. McCarron did, and not getting the extra restricted free agent year? Ah, great question. For those of you who have no idea what Kevin is talking about, the day after Jones was drafted, I wrote a long thing about shutting Jones down for the season, so that he would not earn an accrued season, thus making him a restricted free agent at the end of his rookie contract, as opposed to an unrestricted free agent, where he would be free to sign with any team. Not to praise my own work, ha, but it’s good, and it ended up being right. Go read it. McCarron had a similar situation as Jones, as he suffered an arm injury prior to the draft his rookie season, and the Cincinnati Bengals subsequently held him out for most of the year. McCarron argued that he was well enough to play, and that he was only kept on the NFI (non-football injury) list for most of the season to purposely keep him from earning an accrued season. Through arbitration, McCarron won his case, and was granted unrestricted free agent status. So, yes, the Eagles should absolutely be mindful of McCarron’s situation. Jones was activated from the NFI list late in the season, like McCarron, but he felt that he was healthy much earlier than that. As such, seeing the result that McCarron got, Jones could seek to challenge his restricted free agent status at the end of his contract. 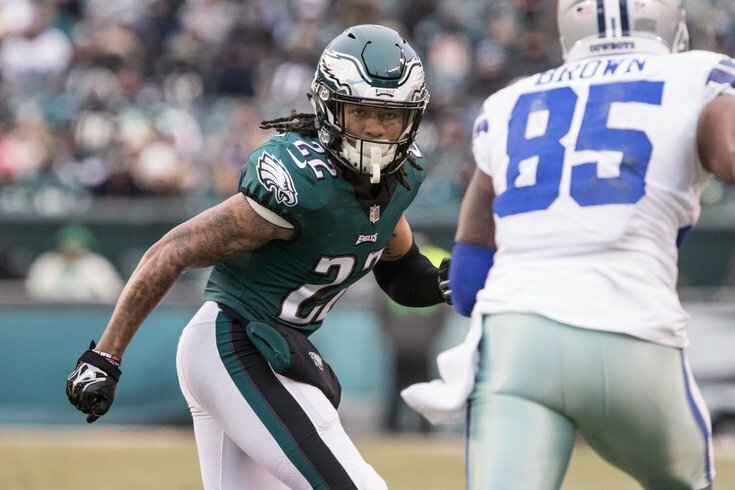 The Eagles would be wise to plan their future with Jones accordingly, not just assuming that they will have him under their control for five seasons. Question from Eagles 1960: Any late-round developmental quarterbacks you like? Yep, Mike White from Western Kentucky. At 6'4, 225, he fits the mold of bigger Eagles quarterbacks, as Carson Wentz, Nick Foles, and Nate Sudfeld are all at least 6'5 and 235 pounds. As you can see in the below highlight reel, White throws a pretty deep ball and has NFL arm strength. On the downside, White was sacked 46 times and he fumbled 12 (!) times in 2017. Bleh. Some of that was on his crappy offensive line, some of it was on him. Still, he's a big guy with arm talent that the Eagles would have time to work with as a No. 3 quarterback if Nick Foles got traded. I think he's a perfect example of that kind of later-round prospect. Fifth round. Question from Chuck: As a Birds fan in New England, what makes you think that Tom Brady is being paid under the table? Not that I disagree. I'm just wondering about your train of thought. Brady has signed four contracts since 2010, and is arguably the best player in the history of the NFL. His contract numbers do not remotely come close to what he should be making. He either has the dumbest agent to ever walk the planet (he doesn't), or something else is going on there. Normally, I could be talked into the player taking less for the good of the team. But, you know, when the player and the team have a history of being the cheatingest bunch of cheats to ever cheat, I'm inclined to think they're gaming the system (cheating) somehow.